I love nothing more than a really girlie day or evening at home with my friends! 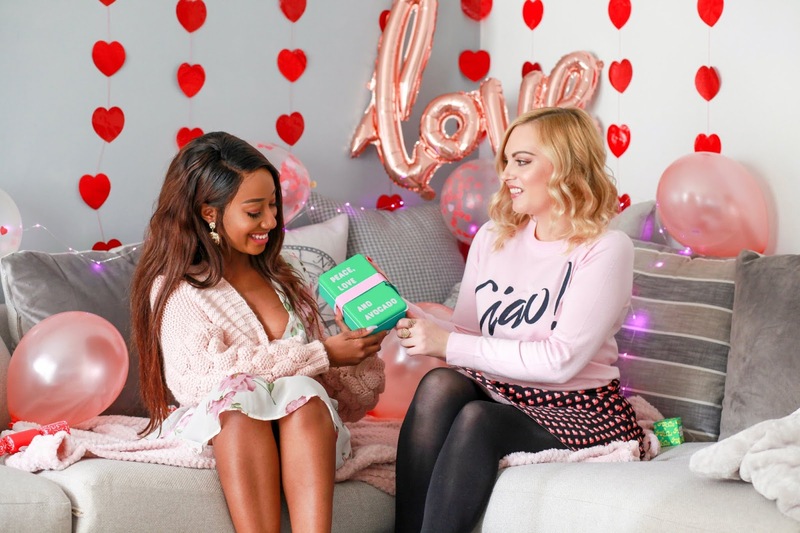 So recently I got together with two of my besties, Rachie & Sarah, for a little pre Galentine’s Day gathering and created our perfect girlie day. It included multiple hot chocolates, chick flicks, pampering and lots of laughter - all snuggled up under my pink fleecy blanket and surrounded by a rather extra display of heart shaped balloons, does it get much better than that?! I think not. We had some lovely gifts to play with too courtesy of Yes Studio. How cute and colourful are these products? I particularly love the slogan mugs which we had our hot chocolates in, heaped with scrummy marshmallows of course plus some cute little heart sprinkles - just in case they weren’t girlie enough! We had the It’s Not You It’s Monday’s mug, the Lover Of All Cats mug (never a truer statement about me!) and the pretty pink Wake Up mug. Mugs always make such great gifts too, I know so many friends who collect cute and unique mugs like this! The Peace, Love & Avocado Lunchbox is so cute and a great size to take your lunch into work with you. We all know someone who is an Avocado addict! I think my sister would love this. Yes Studio also offer a great range of pampering goodies! Their patterned nail scissors, tweezers and nail buffers are lovely and come so beautifully packaged too. They also do these Nail Polish Duos to complete your manicure in a range of great shades! I love the peachy colour in particular with the silver shade on the flip side as a ring finger accent. Or you do some more intricate patterns with them if you & your friends are good at nail art! If that wasn’t enough they also make bath fizzers, you know I love my bath products so I was particularly excited about these. Ours were Jasmine scents and they smelt divine! They come in a range of colours though and are packaged in individual gift boxes. I think it would be such a sweet idea to make up little gift boxes for your friends with one each of these pampering goodies, you could choose which friend would like which nail colour best and pick them out a slogan mug too. No girlie day is complete without films. My favourite chick flicks are Legally Blonde, Clueless, Crazy Stupid Love & Bridget Jones. Although I have draws full of chick flicks so I could go on and on! I think it’s always so important to spend quality time with girls. It’s nice to talk about and share stuff you can’t share with anyone else and can be incredibly bonding. It’s so true what they say - boys come and go but your true friends will always stick by you! Be sure to check out all the gorgeous offerings in Yes Studio Designs Online Shop and use code: KATIEK15OFF for 15% off any purchases. You can also follow them on Instagram @yesstudiodesigns. Which of these products do you reckon your girls would love gifted to them the most? These photos are so gorgeous and what a lovely way to celebrate valentines day, with your gal pals. I've never heard of You Studio, off to check them out now! This is such a lovely idea, and what a fun photoshoot! I have been seeing Yes studios products everywhere lately. I love their fun and creative designs. I'm a huge fan of their mugs! I would use them to store pens and after materials, and maybe a cute plant or two.